For all those times when an app either isn't available or simply won't cut it, your phone's internet browser provides access to your favorite websites and services. But some browsers are flat-out better than others, and chances are, the browser that came pre-installed on your phone isn't the best option out there. For instance, Google Chrome is available on almost every Android device, but despite being a formidable browser, it didn't win the top spot on our list. 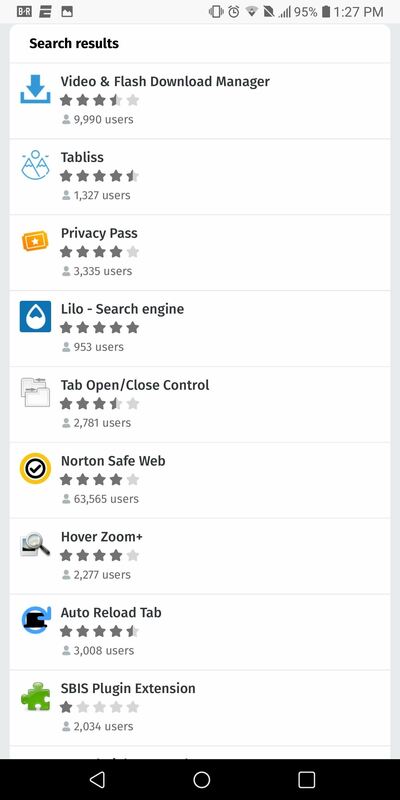 Many of the browsers we've highlighted here offer extra features to improve privacy and performance. So even if you think your default browser is good enough, I'd encourage you to check out our list to see some of the things you're missing out on. To give you a nice glanceable overview, we compiled a chart showcasing the best features from each of the top five browsers available for Android. If you'd like more in-depth information, check out the individual browser sections below. Browser Engine: The foundation of the browser which determines basic functionality and overall speed. Firefox is the only one in our list that uses a different engine, which makes it the only browser that's fundamentally unique. Both Blink and Gecko have similar performance and functionality. Basemark Score: A numerical comparison of each browser's performance (also known as benchmarking). We ran Basemark's browser benchmark on three different devices and averaged the scores. Sync Across Devices: The ability to share data such as history, bookmarks, and saved logins across multiple devices, including desktops, tablets, and other smartphones. Syncing requires logging into the same browser on your other device(s). Tab Swiping: The ability to swipe horizontally on the address bar to navigate between open tabs. Touch to Search: Selecting text will bring up the search engine along the bottom of your display, allowing you to search without ever having to leave the current webpage. Beta Version Available: Before adding new features to the public version, hours of testing are needed to ensure stability. A beta version provides users access to these features weeks before the general population receives them. Data Saving Mode: Manual control over the reduction of data usage. When enabled, websites are compressed before downloaded by users. Themes: The ability to customize the look and design of the browser. Dark Mode: When turned on, all major elements of the browser will become black or dark grey. Ideal for AMOLED displays and night browsing. Reading Mode: This feature adjusts the website for an improved reading experience on mobile. 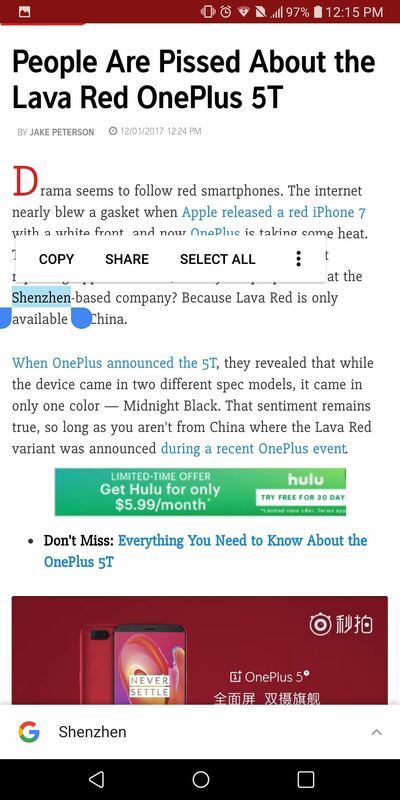 Text better matches the display size and ads are removed. Progressive Web Apps: Websites with the ability to operate as a mobile application. These apps have access to many sensors built into most smartphones, use similar styling, and designed for touchscreens. Besides the websites including support, the browser must also support this feature, allowing the user to add the site to their home screen for independent operation. Private Browsing: The ability to browse the web secretly, without your data saving and syncing across your devices. 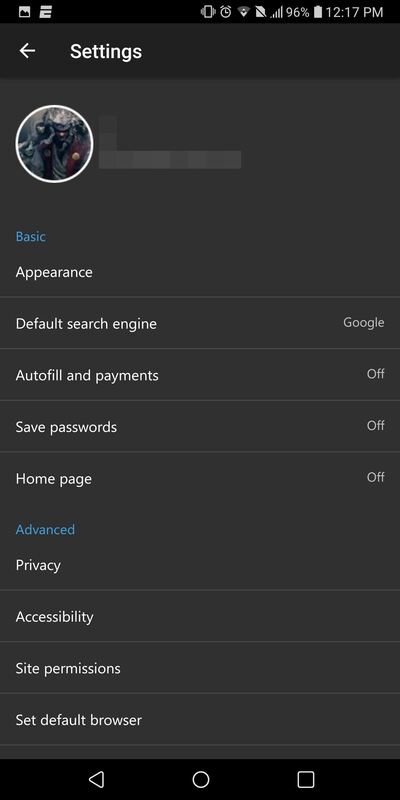 Browsing history and logins are not recorded while using this mode. Ad Blocker: The ability to blocks ads in web pages, either natively or with an extension. Extensions: The ability to add extra features to the browser by installing miniature programs which enhance your browsing experiences. Password Manager: The ability to store password information to autofill frequently visited websites. Mozilla recently updated Firefox across all platforms to include its new Quantum branding and features. Firefox Quantum consists of some backend performance improvements, new custom tabs, and a revamped interface. This new UI is known as Photon UI, which is optimized to help you get things done faster than its predecessor. The most significant change is the use of the new Stylo rendering engine. Stylo is a CSS engine that brings up to 2x speed improvements over the previous version. Stylo combines the innovations from Chrome, earlier versions of Firefox, and the new Servo browsing engine (which is where all the Quantum components come from) to create a faster browsing experience. Firefox is the only Android browser that has true extensions — unlike Samsung Internet, its extensions aren't limited to content blockers. 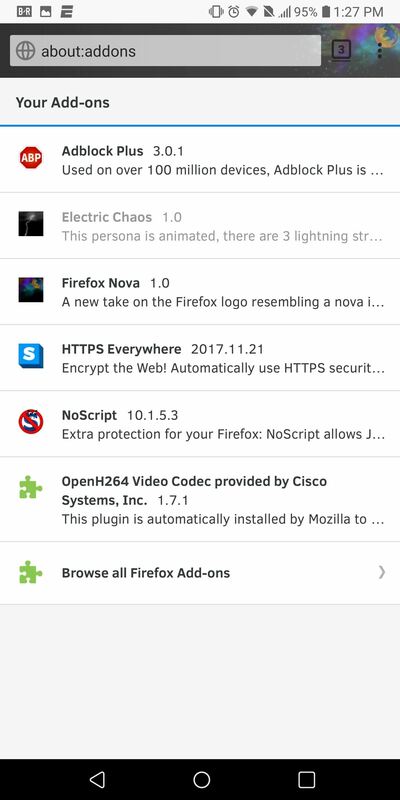 While not as expansive as the desktop version, Firefox Quantum for Android has an extensive collection of add-ons to customize your experience. If you want to use a secure password manager, LastPass and RoboForm have extensions available, for example. The broad range of extensions affords users greater control as to how their browser operates. Unlike its competitors, Firefox grants the ability to theme the browser. The theme collection is large enough that it meets most preferences. Although there isn't a Dark Mode, themes can help simulate a similar experience. Since Firefox is available on all platforms, the ability to sync your account makes browsing a truly connected experience. No matter what device you are using Firefox on, you will always have access to your bookmarks, saved logins, and browsing history. (1) Just some of the extensions available for Firefox. (2) Add-ons include both extensions and themes. When you make Firefox your default browser, you can enable the "Tab Queue" feature, which lets you open links from other applications in the background. Firefox saves these links, allowing you to open the new tab later on, not disturbing what is currently displayed on your screen. Firefox will also offer to open websites in their official Android app with one tap. For example, if you open an Amazon link in Firefox, you can easily open the same page in the Amazon app for Android. However, Firefox doesn't know which apps you have installed, so it will occasionally offer to open links in an external app even when you can't. 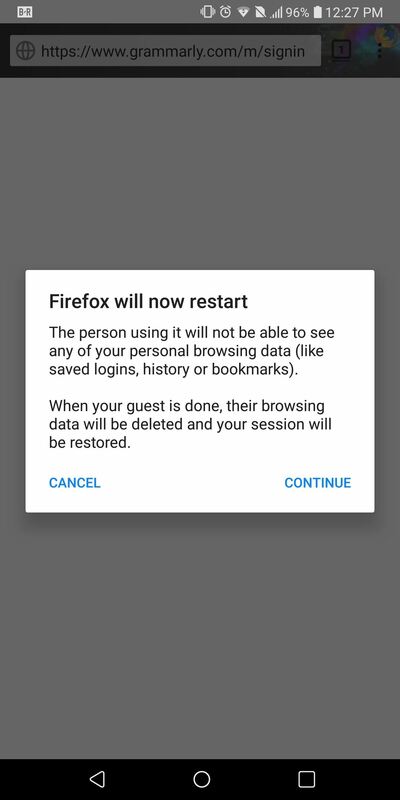 Firefox has a Guest Session mode which acts as a guest mode for your browser. The guest won't have access to your saved data, and anything they conducted during the session is erased on exit. Where Firefox shines is its strong focus on privacy. 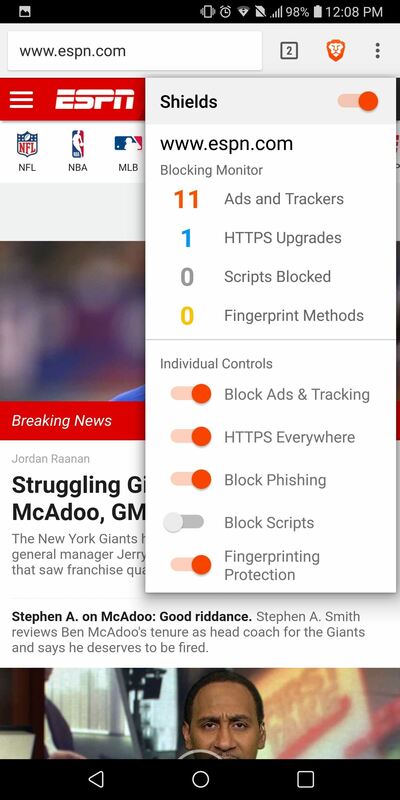 Tracking protection is available to block unwanted trackers. You can even have your data automatically erased when you exit the app. Firefox is also open source, allowing anyone the ability to audit the code. For years, the biggest gripe with Firefox was its slow performance. With Firefox Quantum, Mozilla has improved on it to the point that it is competitive against Google Chrome. With the Stylo CSS engine, extensions, theme support, and a focus on privacy, Firefox Quantum on Android is the best browser available. I'll go ahead and admit it — Samsung really surprised me with this app. As an Android purist, I'm not usually a fan of Samsung apps, since history has shown they typically offer redundancy rather than innovation. However, with their browser (which is now available for all Android devices), Samsung has created an app with desirable functionality not found in the default browser from most other OEMs. One of the best things about Samsung Internet is the ability to install an ad blocker. 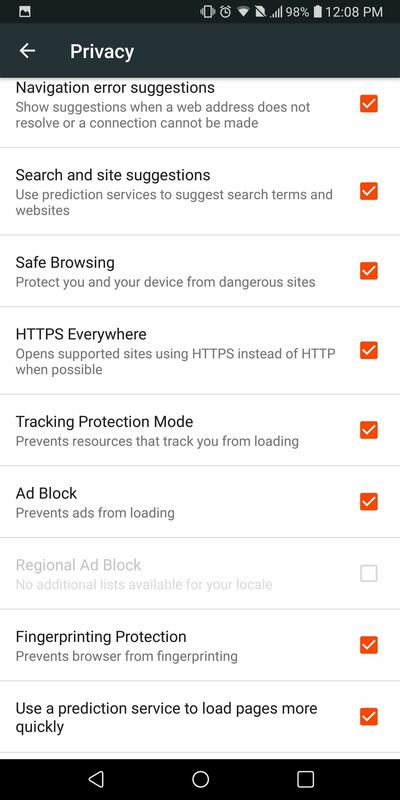 Samsung presents users with several choices, so you have control over which ad blocker you use use. However, unlike Firefox, there are no other extensions available besides content blockers. Samsung also offers tracking protection using an app called Disconnect, which provides top-notch protection against Big Data. Android Oreo's Picture-in-Picture mode is present within the browser, providing access to a feature 99.7% of Android users are still waiting for. It also circumvents the requirement of needing YouTube Red in order to use PiP mode. "Video Assistant" improves the video watching experience by preventing clips from pausing when changing to full screen mode, casting to a Google Home device, or rotating. Tab swiping is present, but unlike the other browsers on this list, you can swipe the bottom toolbar in addition to the URL bar. Samsung allows users to sync their data across devices using both a Samsung account or a Firefox account, improving its versatility. A button above the bottom toolbar to quickly return to the top of the page and a true night mode are useful features that users will love. And the built-in QR code reader will assist individuals in the rare times you are presented a QR code on a website. Samsung's broad range of features and fast performance is the reason it is number two on our list. Pressing this button will return you to the top of the page. Number three and four on our list could easily be reversed, depending on your needs. However, the deciding factor that pushes Brave Browser to the number three spot is its robust set of privacy features, which, in turn, helps make it the fastest browser on our list. Brave's main selling point is privacy protection. It includes many of the highly recommend extensions on popular desktop browsers such as Chrome and Firefox to provide a safe and private browsing experience. It also provides tracking protection to protect against data collection. Users can see what privacy tools are enabled and adjust them easily to balance security with browsing experience. However, Brave takes a step ahead of its competitors by offering fingerprint protection. All this protection provides an additional benefit. Since ads and tracking cookies require extra time to load when visiting a page, blocking them speeds up page-load times. Whether using the average of the three devices or comparing the same device, Brave always achieved the highest Basemark score. While benchmarks don't tell the complete story, they do provide a great constant that isn't refutable. Therefore, although not definitive, benchmarking shows Brave as the best performing browser on our list. Also, since Brave doesn't track ads, less data is consumed when visiting the same website. Another unique feature is Basic Attention Tokens (BAT). BAT is a cryptocurrency used by Brave to reward content creators who depend on advertising for revenue. Since Brave blocks ads, they observe the time users spend on websites and rewards BAT to the creator. As a result, both sides are happy — users aren't tracked by companies, and creators are still rewarded for their hard work. The combination of speed and privacy makes this an excellent choice for users looking to dip their toes into another browser besides Chrome. While not as feature-packed as the previous two browsers, its extensive privacy protection is what pushes it to number three on our list. Microsoft's foray into the smartphone industry has been a rough ride. As of Q1 2017, Windows Phone 10 had an estimated market share of 0.1%. This has led to Microsoft adjusting their strategy, focusing on bringing their services to the more established mobile operating systems instead of competing against them. As a result, we now have access to Microsoft Edge on Android. Microsoft has introduced many Android apps in recent years, including an underrated Android launcher and the entire Office suite. Their most recent app release is the Microsoft Edge browser with its amazing speed. Just some of the Microsoft apps available on Android. Unfortunately, things aren't exactly what fans hoped for. Instead of using Edge's EdgeHTML found on Windows 10 desktops and laptops, Microsoft chose to use Blink (the same engine as Google Chrome and every other browser on this list except for Firefox). At best, Edge will match Chrome's speed, but not surpass it. On the plus side, Microsoft has limited the features it's adding to keep Edge lightweight. This translates to a very quick browser that placed third in our Basemark benchmarking tests. 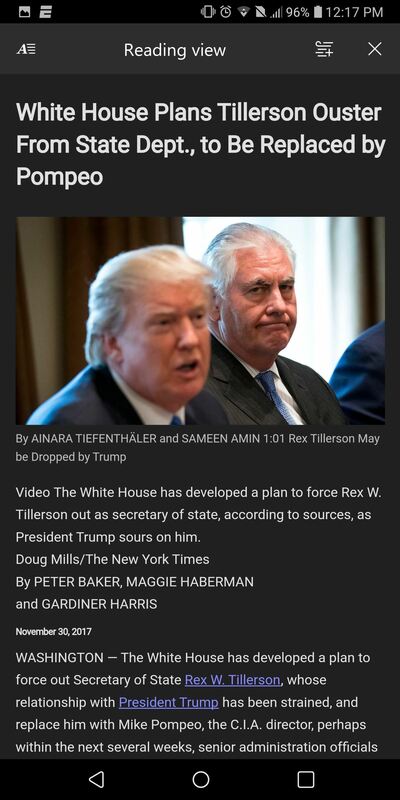 Microsoft also included a kind of handoff feature that allows users to continue their mobile browsing on their desktop (or vice versa) with the press of a button. However, it doesn't work all the time and requires the Fall Creators update to Windows 10, something not all desktops are running. Thankfully, your data can be synced across all platforms (except macOS) using a Microsoft account. Edge is one of the few browsers found in the Play Store with app-wide Dark Mode. 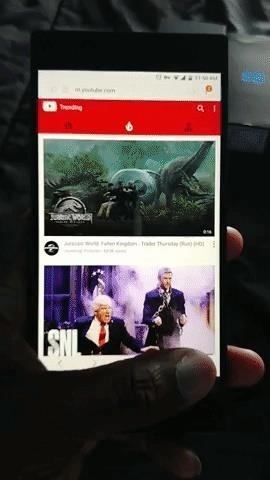 With many phones using AMOLED displays, this feature is much appreciated. There is also a password manager built-in, although we don't recommend using it. Microsoft Edge now has native ad blocking capabilities. Leveraging the service of Adblock Plus, Edge is now one of three apps on our list that is capable of blocking ads. While this may seem to hurt their revenue stream (which depends on ads), Microsoft services are whitelisted thanks to payments of 30% of additional ad revenues by Microsoft (Google and Amazon also made this payment). 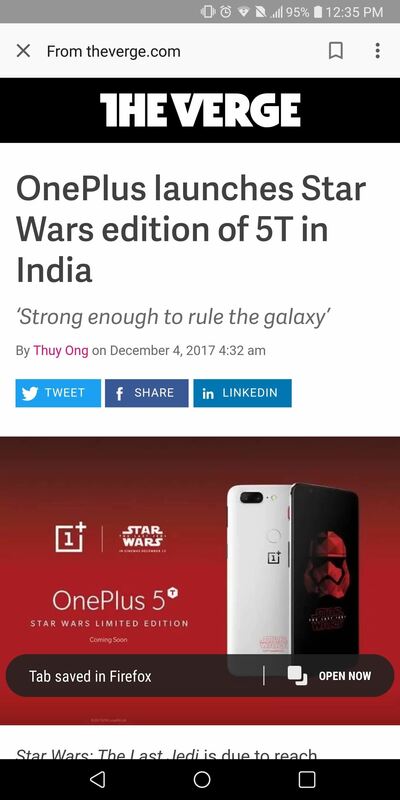 It was released in mid June but it hasn't hit any device as of yet. So the question is, who is this for? If you are a Windows 10 user and an Edge desktop user, this browser is for you. While we were hoping for EdgeHTML from the desktop, the Blink engine borrowed from Chrome is one of the fastest on the market, and allowed Edge to fall only 5 points from second place on the Basemark benchmark. With the ability to send sites to the desktop, a complete dark mode, and reader mode, this is the browser for those locked into Microsoft's ecosystem. Google Chrome is the default browser, and for many, the only browser ever used on Android. Chrome is a stable browser and is heavily integrated into the Android OS. If an app created by Google benefits by accessing your data, it's at least partially integrated with Chrome. What this enables is a more personal experience. 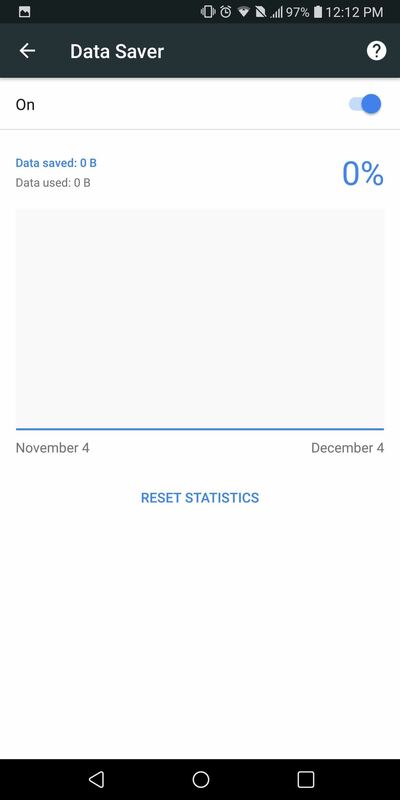 For example, Google Assistant uses browsing data to better personalize responses, and passwords saved in Chrome will now auto-populate into apps if you're running Android 8.0 or higher. Since Chrome is a part of the Android platform, it is tied to your Gmail account and syncs across all devices where you use that same account. Whether on Windows, macOS, Linux, Android, or iOS, your data will travel with you. 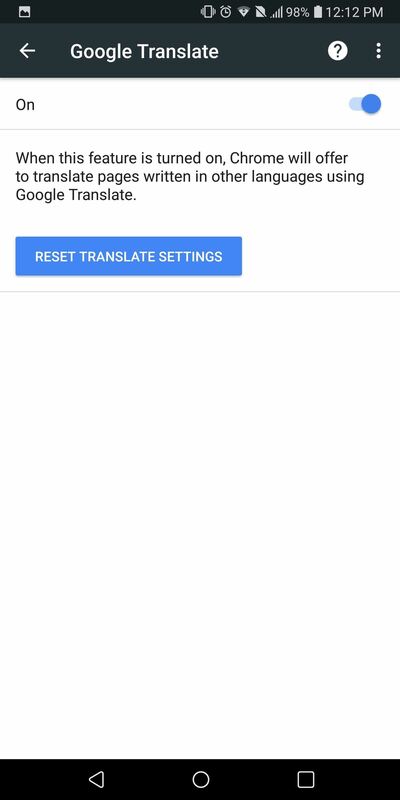 Another great example of Google Chrome integration is its built-in Google Translate. 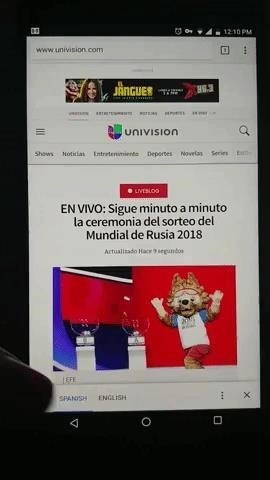 When accessing a website in another language, a popup along the bottom will emerge showing two tabs. One tab will be labeled with the current language and the other with your default one. Selecting the second tab will translate every bit of text on the page to your native tongue. Google Translate has dramatically improved since its inception and is a great way to read news from other countries. Chrome is the model that all other browsers strive to match when it comes to performance. It's been the fastest browser for years, thanks to its Blink engine, and has only recently been challenged. Notice how I said challenged — no browser on this list consistently beats Chrome's performance on all websites. At best, they beat Chrome's page loading times on a few websites, but never across the board. Google Chrome is the only browser on the list with a Data Saver option. When enabled, data will be compressed using Google servers before being downloaded by your browser. Image quality is reduced, but overall data consumption will decrease significantly, which is great when you're on a limited data plan. Most browsers have an array of features that help reduce data consumption automatically, but Chrome is the only one with manual controls. Touch to Search lets you highlight any word to perform a search without leaving the current page. And Physical Web allows the user to interact with real objects and receive relevant information about them (if supported by the object). Google's Instant Apps are only accessible while using Chrome. When you do a Google search for a supported app in Chrome, Google will let you download a lite version of the app without installing it. 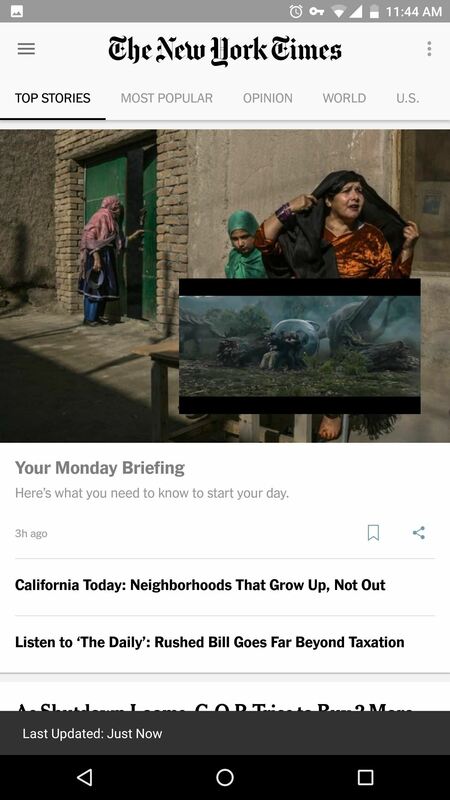 The app is fully featured, but a lot smaller in size and can be deleted in one tap. Despite Google announcing the feature during Google I/O 2016, only a handful of apps support it so far. Google Chrome is an excellent app for the majority of Android users, providing a basic browsing experience and very little more. The only reason it ranks last on our list was because of Edge's recent ad-blocking feature that gave it the edge (pun unintended) it needed to overtake Chrome. 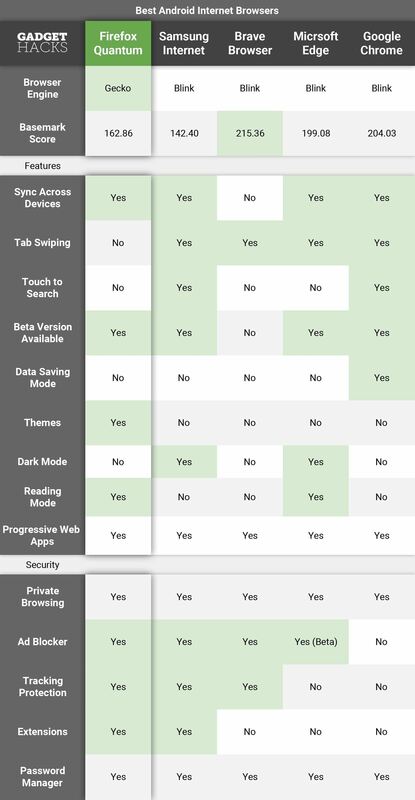 Chrome is good, but as you can see on our list, the other browsers offer more using the same engine (except for Firefox). The wide variety of browsers available on the Play Store provide us with excellent choices. Depending on your needs and the ecosystem you are most invested in, you'll undoubtedly find the right browser for you. For those looking for the single best overall experience, look no further than Firefox Quantum. No longer is Firefox painfully slow as the Stylo CSS engine has significantly improved performance. With an extensive collection of extensions and an emphasis on privacy and security, you should look no further than Firefox Quantum. What browser are you using? Did this article encourage you to switch browsers? Let us know in the comment section below.